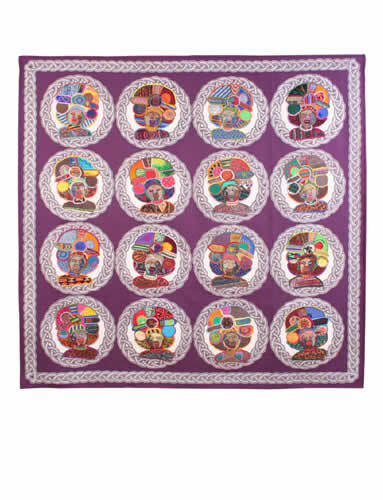 This quilt forms a pair with the Woman of Africa (No. 0017) quilt. The Rickshaws are framed in machine quilted rope circles. Each portrait was hand embroidered in the Sri Lankan style. The Purple backing is finely filled with an ethnic tri-angular quilted pattern and finished with a matching two color rope border. It took approximately 30 000 meters of thread and 300 hours of work on a sewing machine to complete the quilting portion of this project. In Durban, South Africa, these colourfully dressed men can be found transporting tourists around the beach front, on their two wheeled Rickshaw.